As the population ages, more of us are faced with the prospect of moving either ourselves or an older family member into a nursing home. It may be a decision that arrives suddenly following hospitalization, or gradually as needs become more difficult to meet in other types of housing. To make a decision that's right for you or your loved one, it's important that you know your loved one will receive the best care from people who care about your family. A feeling of welcome the moment you pass through our doors. A fun and stimulating environment that keeps every guest actively involved. 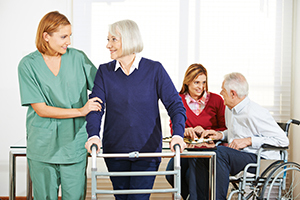 24-hour nursing staff, physical therapy, and other licensed care professionals that give guidance through personalized therapy and assist in achieving maximum quality of life. Religious services, music, crafts, physical fitness programs, and other special events. A modern, state-of-the-art and state-of-the-heart facility. Our entire staff will greet you by name, ask you how you are doing, and will strive to meet any needs that come. To schedule a visit with us or for additional information call (432) 652-8628 and we will be happy to assist and to help you find out why The Center is the right choice for you.